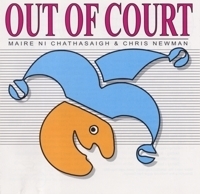 In late 1991, Máire and Chris released 'Out of Court', an effervescent mixture of baroque-influenced Carolan, straight-down-the-line Irish dance music, haunting songs and a 17th century air from the ancient Irish harp tradition, interspersed with original compositions which exhibit some dazzling jazz-influenced pyrotechnics. They're joined by a stunning selection of star guests: legendary uilleann piper Liam O'Flynn; Máire's gifted fiddle-playing sisters Nollaig, who has been a member of bands as diverse as Planxty and the RTE Symphony Orchestra (!) and whose virtuosity, versatility and lyricism are displayed throughout the album, and Mairéad, whose distinctive, subtle and very traditional style is featured on one track, "Frieze Britches"; bass player Danny Thompson, renowned in jazz and other music circles and known to folk music fans since his early days with Pentangle; and mandolin maestro Simon Mayor. Will You Meet Me Tonight On The Shore? A swing jazz-influenced composition with improvised solos from everybody. 3.Will You Meet Tonight On the Shore? Máire learnt this beautiful song many years ago from Rita Gallagher, a fine traditional singer from Donegal. We're indebted to Mairéad for her most unusual and creative setting of this seven part tune,which is based on that of Pádraig O Caoimh. Composed by the famous blind Irish harper and composer Turlough O' Carolan (1670-1738) in honour of a lady who lived near Mallow in the north of Couty Cork. A sort of jig inspired by a Fernando Sor tune! A traditional spinning song learnt by Máire as a child. A traditional hornpipe preceeds a reel by the famous Scottish fiddle-player and composer, J. Scott Skinner. Written by Chris in hounour of his favourite bridge. According to Bunting. This powerful and beautiful air was composed as a faerwell to the "gallant remnant" of the Irish army who went to the capitulation of Limerick in 1641, and was sung by the women on the shore at the time of the embarkation. During the next 50 years, 450,000 of the Wild Geese died in the service of France-a figure which gives us some ideas of the scale of this tragic diaspora. Learnt from Margaret MacArthur,a fine singer and collector from Vermont, New England: Lake Champlain separates Vermont from northern New York State. This song started life in Ireland where it is known as the Lakes of Shellin or the Lakes of Cool Finn. Finally, another tune written by Chris which provides a last chance for a solo or two. From the earliest times, the ancient Irish harp was a court instrument, played by and for the Gaelic aristocracy, and it's music, like most other forms of art music was sophisticated and technically demanding. When the old Gaelic order began to collapse after the defeat at Kinsale in 1601, the harp and its music went into gradual decline. Le Gouz, a visitor to Ireland writing in1644, tells us that nearly all the nobility at that time were accustomed to play the harp as well as listen to it: by 1792,only ten performers could be found to take part in the Belfast Harp Festival, and of those, only one, Denis Hempson, played the old repertoire in the ancient manner, with his nails-and he was 97 years old. During the nineteenth century, the harp once again began to enjoy a certain vogue, this time among the more nationally-minded of the Victorian middle -classes, but it was largely used to accompany songs, in a manner so influenced by Victorian drawing room taste as to effect a fundamental alteration in the character of the music. The harp has continued to remain aloof from the living oral tradition almost until the present day. The true artistic spirit of the harpers was inherited by the pipers into whose repertoire passed much of the music of the harp: the uilleann pipes were a gentlemans chamber instrument developed at about the turn of the 18th century. The harp is partnered on this recording by the guitar, an instrument which has accomplished the transition to the twentieth century with superlative ease.We range from the grandeur of the court music as represented by "The Wild Geese", to the baroque-influenced music of Carolan, to traditional dance music (which is Máire's speciality and something totally new to the harp tradition) to original compositions in the traditional idiom, to jazz-influenced original compositions with improvised solos- a unique demonstration of the adaptability of the Irish harp to the world. We're fortunate to be joined on this recording by a cross section of our friend and relations, who also happen to be the finest exponents of their instruments that you're ever likely to hear. We're very grateful to them all. Copyright exists in all Old Bridge Music Recordings. Unauthorised copying, re-recording, broadcasting, public performance, hiring or rental of this recording prohibited.